Today it was sunny yet still a bit cold in Delft. I had the chance to go for a coffee (it was fruit juice and hummus bagel, to be honest) with a friend so I was still feeling full by lunchtime. We decided to eat a bit later and I wanted to cook something light. This is what I came up with. That is a very easy dish, suitable for the first-time cook. It looks good enough to serve on a first date dinner too. Start by boiling 1,5 liters of water. When the water boils, turn the heat off and drop the noodles in. Let them soak in the hot water for about 7 minutes. 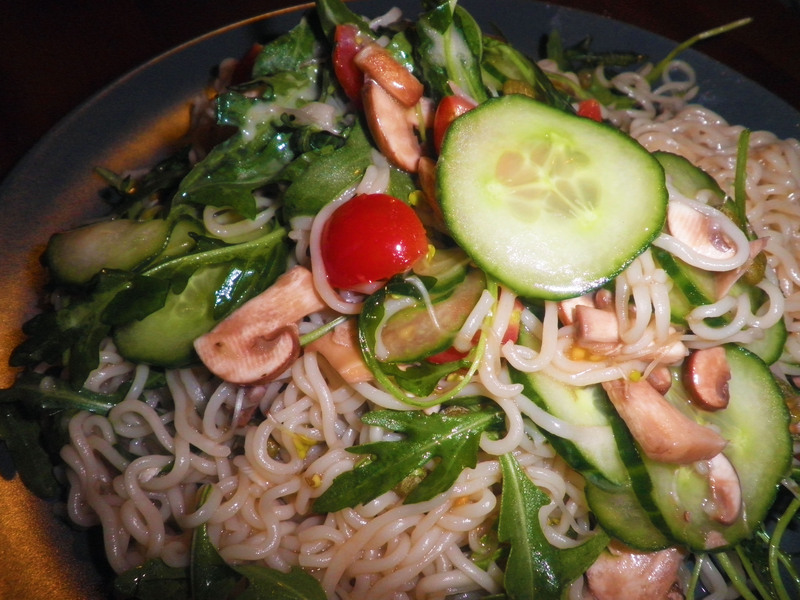 Slice thinly the cucumber and the mushrooms and chop the cherry tomatoes. 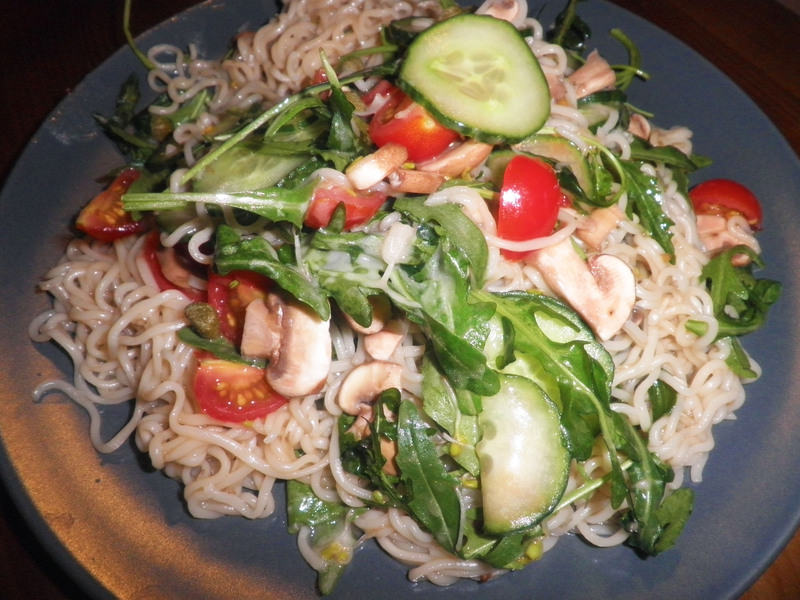 Drain the noodles, put them back in the pot and throw in the cucumbers, tomatoes, mushrooms, sprouts, rocket, capers, olive oil, balsamic vinegar and mayo. Stir with a fork until everything is mixed. 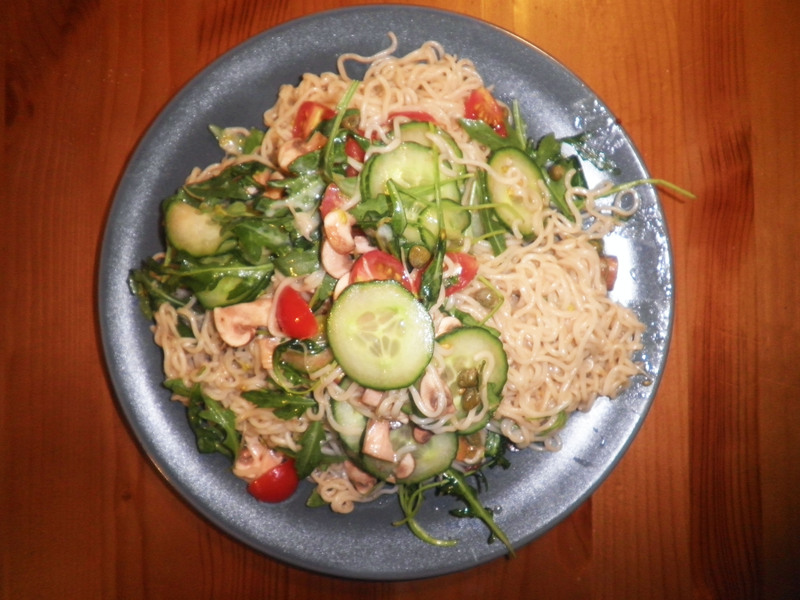 I called the recipe “warm and cool” because the noodles are warm while all the other ingredients are raw, straight from the fridge. Serve and make sure to scoop the vegetables from the bottom of the pot. They are heavy and they hide down there. Now, why would you cook that dish, apart from the fact that it is super fast, easy and impressive? Well, this Wikipedia article has big part of the answer. Among other things, it explains how beneficial broccoli sprouts have proven to be to fight off breast, colon, stomach, skin and bladder cancers. They also lowers high cholesterol levels (the bad cholesterol, that is), they help regulate blood pressure and diabetes. Capers is rich in protein, fiber and especially iron. Now, if you are following a vegetarian or vegan diet, you already know that iron is the first nutrient that people will nag you about. Next time this happens, you can inform them that you eat plenty of capers and 4 tablespoons of capers provide 6mg of iron, with 18 mg being the daily requirement. Apart from this recipe, you can add capers to sandwiches and salads. The second nutrient that people will nag you about is calcium. Rocket (aka arugula) will take care of that. A cup of it contains 32 mg of calcium. It also contains 74 mg of potassium and it is a great source of vitamin A, which is a powerful antioxidant. Olive oil carries even more antioxidants, called polyphenols. It also helps calcium absorption and protects you form osteoporosis. Olive oil, and particularly extra virgin olive oil, has been found by multiple researches to have health benefits having to do with cognitive, digestive and heart health as well with the regulation of cholesterol. So do not wait any longer. Go cook this thing. And if you are on your own and it is too much, just store it in the fridge. It is great cold as a pasta salad. Just make sure to consume it the same day, as the balsamic vinegar will cause the vegetables to wither.